After going to the effort of buying and roasting an organic chicken, I try very hard to make the most of the leftovers. I really think there is something to be said for trying to approach cooking, and household management as a whole, the way our grandparents did. So many things, including the food we eat, have become disposable. This concerns me, not just because I care about what I feed my family but also because I care about what we throw out after we are done. Wherever I can I make things at home instead of buying them from a store and chicken stock is a good example of this. I have recently gotten in the habit of making stock after I have pulled all of the leftover meat off of the chicken. 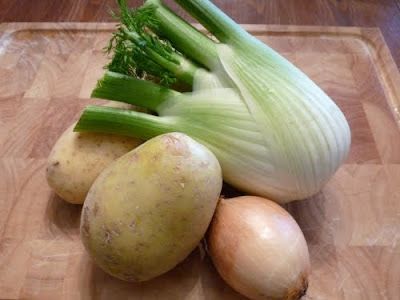 I began doing this partly in an attempt to be more frugal and partly because it makes a much better stock than what you buy from the supermarket. Also, it is ridiculously easy. 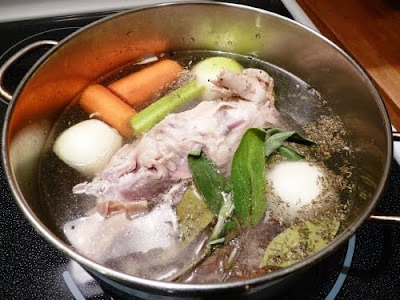 I just throw the chicken carcass in a stockpot and add enough water to almost cover the bird. Then I add some spices, some vegetables and let it boil for an hour or so. When it is done strain the broth from the pot with a fine sieve and you have chicken stock. 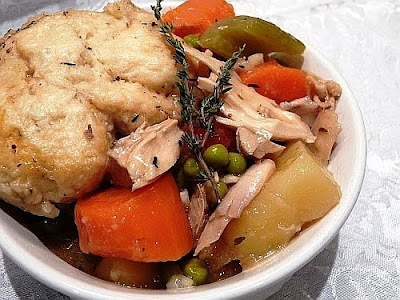 In a large stockpot or Dutch Oven place chicken bones and remaining ingredients. Cover with water. Bring to a boil and then reduce to a simmer. Cover and simmer 1 to 1 1/2 hours until you have a golden and aromatic broth. Strain liquid through a fine sieve into a large bowl. Can be used immediately or stored in the refrigerator for 2-3 days. If you will not be using the stock within that time it can be kept in the freezer for up to 6 months. Saute onion, carrots, celery, potato and garlic in the 2 tablespoons of olive oil in a large saucepan or Dutch Oven over medium heat for 5 minutes or until onions begin to turn translucent. Add 4 cups of chicken stock, herbs and salt and pepper and bring to a boil over high heat. Immediately reduce to a simmer. Cover and simmer for 20 minutes or until vegetables are tender. Stir in diced chicken and diced tomatoes. 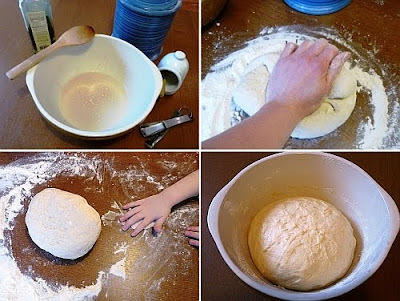 In a small bowl mix the remaining 1/2 cup of stock with the 1/3 cup of flour to form a slurry, or thick smooth liquid. Pour the slurry into the simmering stew. Cook and stir until the broth is thickened. Stir in the frozen peas. At this point you can either serve the stew as is or make dumplings before serving. Mix the dry ingredients in a bowl. Mix the milk and oil and pour over the dry ingredients. Stir with a fork just until combined. Drop heaping tablespoons of the mixture on to the bubbling stew creating 4-6 mounds. Immediately cover the stew with a lid and leave to simmer 10 to 12 minutes. Do not lift the lid. After 10 minutes or so check to see if the dumplings are done. They should appear dry on the top and be firm to the touch in the centre, or a toothpick inserted in the centre will come out clean. Serve immediately with the stew. I have been thinking a lot about chicken lately. After reading The Omnivore's Dilemma by Michael Pollan I found myself thinking a lot about what we eat, especially the meat. Growing up, meat always had the staring role at any meal; roast chickens were a weekly occurrence, roast beef a once a month Sunday night dinner treat and roast turkey a holiday staple. It was just the way we ate meat, always as the focal point of the meal. I'm sure many people had the same experience. Now I don’t really eat like that. We tend to eat pasta more often than roasts. Sure, turkeys are still a holiday staple, but the roast chicken once a week is a thing of the past, at least in my family. It’s not that I don’t like a nice chicken dinner, but I make a conscious effort to serve vegetarian meals at least twice a week and the rest of our meals tend to be small cuts of meat or fish (don’t get me started on my angst about eating fish) with more vegetables. But Michael Pollan’s book made me think even more about where my meat was coming from and how it was raised. I began to feel concerned about industrial farming practices and the impact they are having on our health, on the environment and on the animals. So, now, when I buy meat I try very hard to buy organic or at least traditionally raised. It costs a little more, which means I buy meat even less often, but I do feel it makes a difference. Chicken, in particular, tastes better and has a firmer texture. And when I buy it I make sure I get the most out of it. 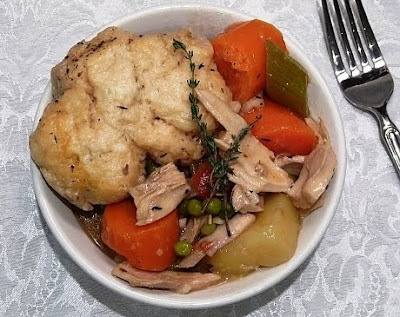 I roast the bird, then I make stock from the bones and I make chicken stew or chicken soup from the leftover chicken, but more on that later. 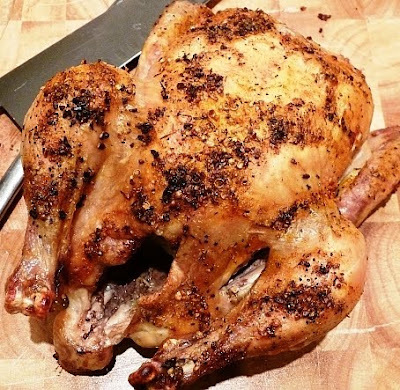 When roasting, there are a number of different methods I use, but sometimes what I feel like, and all a good bird really needs, is a little bit of seasoning and that’s it. Rinse chicken inside an out with cool running water. Pat dry and place breast side up into a roasting pan. Salt and pepper chicken cavity and stuff with onion quarters and lemon half. Do not overstuff as this will slow down the cooking process. 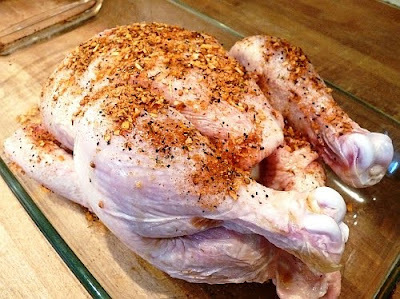 Rub breast and legs of chicken with olive oil or melted butter and sprinkle with good amount of salt and pepper or seasoning mix. You can truss the legs together at this point but I don’t bother. 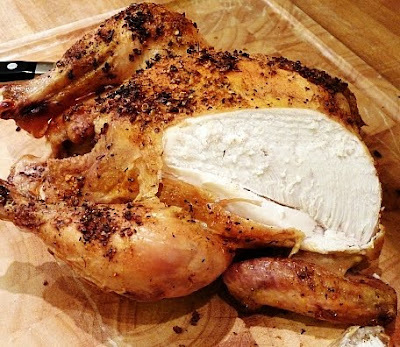 Roast chicken for 1 ¾ -2 ¼ hours or until juices run clear when you poke a knife into the crease between the breast and thigh bones. You can also test if the chicken is done by using an oven thermometer. The internal temperature should read 180-185 degrees when the thermometer is stuck into the thickest part of the inside thigh muscle, near, but not touching the bone. The leg should also move easily in the socket and the meat on the leg should feel very soft. If you used a roasting pan that can be placed directly on the stove top, use that pan for making the gravy. If not, you will have to move the pan juices to a pot that can be used on the stove top after you complete the first two steps. Angle the pan so that the drippings collect to one side and using a shallow spoon, skim the fat off of the top. Sprinkle the flour into the remaining pan juices while still in the roasting pan, but do not place on the stove top. Whisk the flour into the pan juices, scraping any brown bits from the bottom, creating a thick smooth paste. At this point either move the drippings to a pot that can be used on the stovetop or place the roasting pan on the stovetop and turn the heat to medium. While whisking add 1-2 cups of chicken stock, creating gravy to your desired consistency. Season with salt and pepper and serve warm over the carved chicken pieces. One thing I've learned about cooking is when things go wrong, you just have to roll with it and keep going. And sometimes accidents produce great results. I woke up this morning the way I do most mornings, completely unexcited about breakfast. I am not a breakfast person. Actually, let me amend that statement, I am not an everyday breakfast person. I love fancy egg dishes, bacon, pancakes, etc, but you can't eat that everyday and I just don't like toast or cereal or any of the ordinary breakfast offerings. So I usually wake up feeling a bit let down by what is waiting for me in the kitchen. My children and my husband would happily eat bowl after bowl of cereal everyday (which they do). I end up sitting at the table with a cup of coffee mentally going through my options (cereal...no...toast...no...oatmeal...no) and eat nothing. 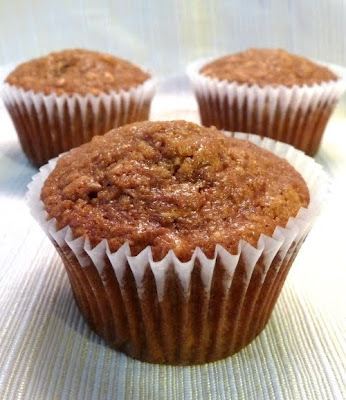 But this morning I thought I would like a bran muffin and as luck would have it I have a really great bran muffin recipe. So I immediately started with the recipe, mixing the wet ingredients, sifting the dry ingredients and then I get to my wheat germ and it seems sort of...wrong. It is clumped together and looks like it is moldy, yuck. But I am half way through the recipe. After a minute of thinking I decide I need something to compliment the molasses that I have already added to the wet mix, so I add a half cup of whole wheat flour to replace the missing bran. But I also want something with the same hardy texture so I add a cup of oatmeal. 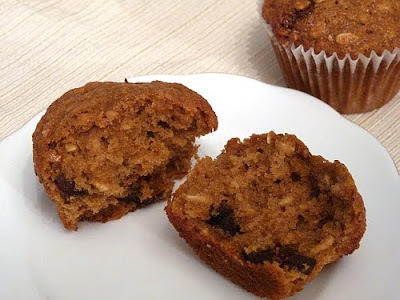 And finally I add about 3/4 cup of chopped dates because they are a great addition to any bran muffin recipe. The end result was a really moist flavourful multigrain muffin. It had a very similar taste and texture to my bran recipe but the flavour was a little more subtle with the addition of the oatmeal. Definitely a happy accident. I have had this recipe forever. It originally came off of a wheat germ box, but I unfortunately have lost the brand name. I am giving both the original recipe and my substitutions below. Preheat the oven to 400 degrees. Position rack to the middle of the oven. I went through a time, not long ago, when I was completely over pizza. I think my husband and I must have tried every pizza place in the city and I was always, always disappointed. In their defense, I don’t think many foods stand up well to a half-hour car ride. Nevertheless, we went through a long separation. 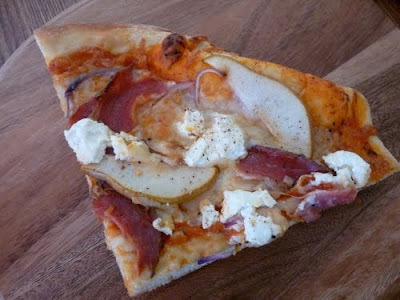 Then I discovered how easy it was to make pizza at home and now I am happy to say that pizza and I are reconciled. I am convinced that if you use store bought dough, and there are some really good ones out there, that it does not take any longer to make pizza at home than it does to order it. Pizza at home costs less, is always hot and fresh and made exactly as you want it. And, as you can see by the hands of my little helper, it is something that the whole family likes to get involved in. If you are feeling even more adventuresome, pizza dough is not hard to make. 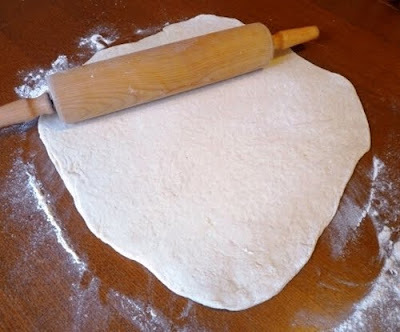 There are all kinds of quick dough recipes available on the internet and they can be ready to roll in about 20 minutes. They usually turn out a nice thin, crisp pizza. 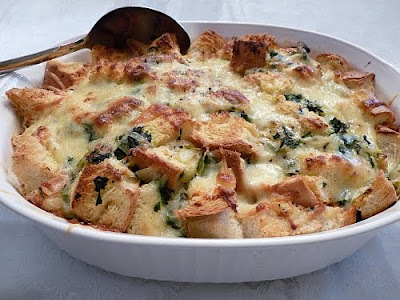 My favorite recipe takes a little longer, about an hour and a half, but it makes enough for two pizzas and you can refrigerate or freeze the dough for later use. Whatever way you chose, store-bought or homemade dough, pizza at home is the way to go. When I was younger it was the social aspect of food that initially attracted me to the idea of learning how to cook. There was something powerful about the ability to draw people together with good food. I liked the idea that something I created could be more than just a good meal but could also be a good memory. That was how I felt about going to my grandparent's house. The food was amazing, as always, but it was more than the eating of it, it was the ritual and the family experience that I found most attractive. We had little routines that became part of my shared consciousness with my family, such as where I sat at the table (always beside my grandfather, so that I had the best seat to listen to his stories when dinner was done) or how many dessert we had, or breaking out the leftovers just hours after we had finished dinner (when we were playing games). So now I enjoy entertaining for my family and friends, and I hope that I am creating the same experience for them. But along the way I discovered that it was not as effortless as my grandparents and parents made it seem. The challenge was making the food and still having time to spend time with your guests. I often made the mistake of making something intricate and “gourmet” that required so much attention that at the end of the evening I felt like all I had done was work in the kitchen while my guests and my family socialized. After awhile I got smart and realized that it was possible to make memorable food and spend time out of the kitchen. Dessert is a very regular occurrence around my house. I am a slave to my sweet tooth and I’m afraid I have passed the addiction on to my children. 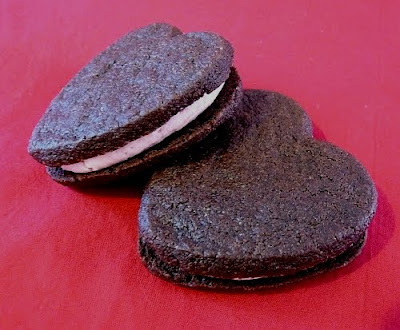 They are, of course, devoted to cookies, chocolate, cake; pretty much anything over the top sweet. Truth be told, I am not adverse to such things either, but sometimes I want something a little more grown up. 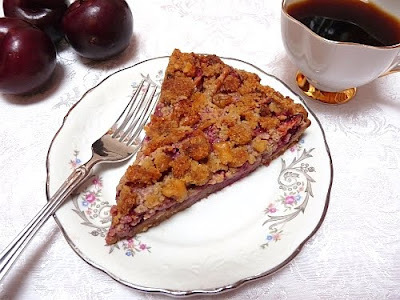 This Plum Walnut Tart is one of my absolute favourite desserts. 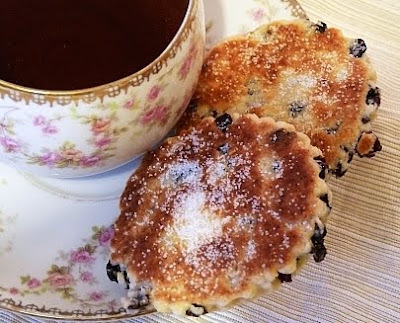 It is tart, not too sweet and the nuts add an amazing richness and depth of flavour. 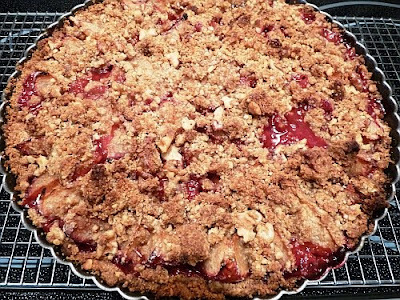 The plums create a deep red syrup as it bakes, so the end result is a colourful and rich looking dessert. I have a confession to make. When I said that we make chocolate chip cookies more that anything else I was not being completely truthful. 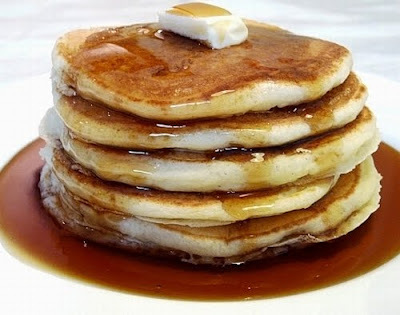 They actually come a close second to pancakes, but my omission was due to the fact that, particularly among my children, pancakes are often viewed merely as a syrup delivery system. We go through a shocking amount of maple syrup in this house and our devotion to this amber liquid borders on the religious. 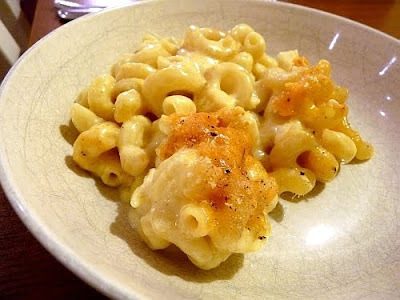 We buy 4 litres at a time from a small family run operation in Campbellford, the same small town where we buy the amazing cheese that I used in my Drop Biscuit and Macaroni and Cheese recipes. 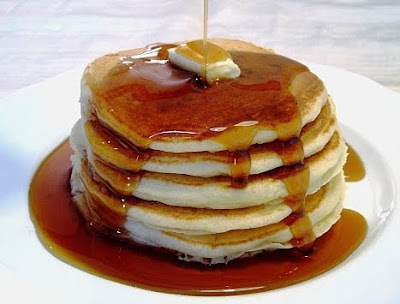 Curles Maple Syrup has been in operation since 1862. In fact, the same family has been producing syrup in this sugar shack for 7 generations. 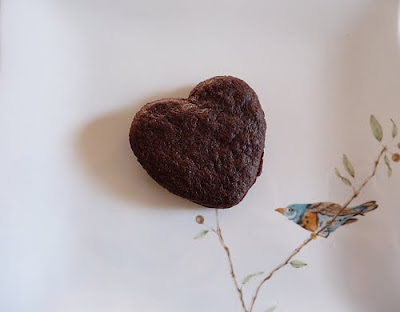 In honour of Valentine’s Day I decided to write a post that included some chocolate decadence. Valentine’s Day has never been a big event for me but I do remember one in particular. When my husband and I were first married he decided to surprise me after work and take me out to dinner. Unfortunately, the place he picked did not accept reservations and by the time we got there at 8 o’clock the wait was TWO HOURS. We didn’t know what to do. The restaurant was so busy we had to go on a wait list just for a pager that would tell us when a table was ready. Any place we went would have been just as busy and we did not want to go home, so we put our name on the wait list and went to the bar area to discuss our options. The bar was jammed wall to wall and we stood packed into a corner by the bathroom trying to figure out what to do next. At one point a girl who was sitting at one of the bar tables with her date caught my eye. We looked at each other in a sympathetic way, silently commiserating over our situation. After a little while she called me over and said that she and her boyfriend had given up and were going home and would we like their pager. We were thrilled. To thank them for their thoughtfulness I gave them the chocolate covered strawberries I had bought earlier in the day. About 15 minutes after they left the pager went off and we had a table. 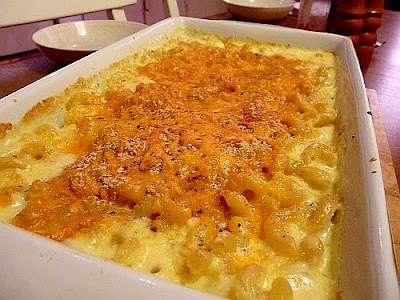 Macaroni and Cheese is one of those things I make up as I go along, so the recipe is different every time, which is both good and bad. Good because I can use up whatever cheese is in the fridge (and there is always a lot) and bad because when I make a good batch I can’t always re-create it the next time. 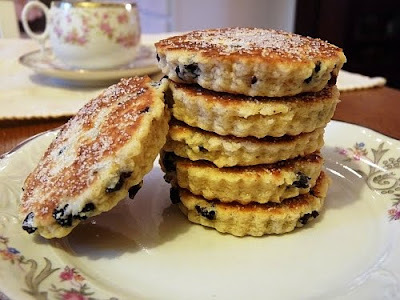 Darby Cakes or Welsh Cakes? Sometimes you find great food in the most unexpected places. A few years ago my husband and I took our daughter on a visit to one of the historic homes in the city and they were making something called Darby Cakes in the kitchen. It was a biscuit, sort of like a Scottish Bannock that was cooked on the stovetop. They had a great flavour and were almost like a cookie. I loved them so much I asked for the recipe, took it home and promptly lost it. Since then I have been trying to find it but to no avail. Let’s talk about chocolate chip cookies. There is probably nothing that gets made in my house more often than the chocolate chip cookie. To me they are the ultimate comfort food. They were a staple when I was growing up. That smell of warm cookies emanating from the oven is like a siren’s call to me and it now has the same effect on my children. 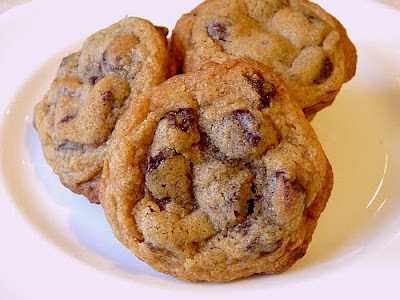 When I was younger, there was quite a debate in my family as to what was the perfect chocolate chip cookie. For my sisters and me the best was just out of the oven, warm and soft. My father, on the other hand, inexplicably preferred them crunchy. So my mother, in deference to both, would bake the first batch for us and then the last half would be left in the oven to brown a little longer. My father would eat the rest of the cookies once they had cooled and hardened. To this day I question his sanity, but I have resolved that I cannot educate him on the error of his ways. He will not be swayed so we must assume he is crazy and move on. 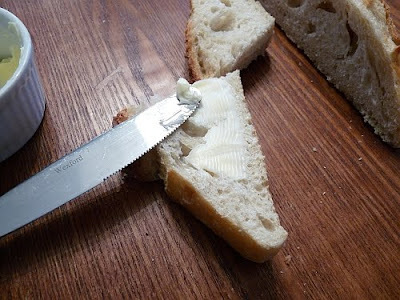 I was going to write a post about bread. About how I love the smell of fresh baked bread and how nothing else reminds me of my grandfather and working in his bakery like that smell. I was going to do that and then my oven conked out. It died right while I was baking a loaf of bread. When my oven started beeping and showing signs of distress I immediately called my neighbor to see if I could borrow hers. She said yes as she is very kind and always willing to help out with my baking experiments, especially the eating part. As they say, no good deed goes unpunished and this time she was punished by having a hole burned in her entranceway rug. After I finished baking the bread, I, in a moment of mental lapse, set the hot pan down on her rug while I got on my shoes. Melted my pan right to it. Needless to say she got the bread…and a new rug. When all of this happened I was trying a new recipe I found at Honey and Jam. As it turns out, this bread is great. 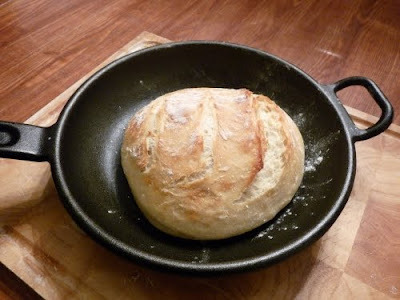 It is easy, no kneading, very little wait time and the result is a wonderful crusty loaf. 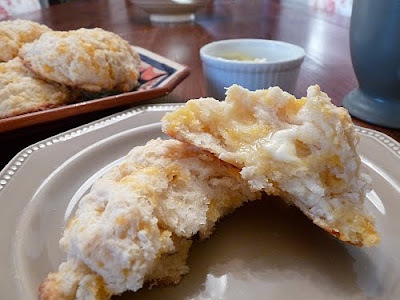 There are just so many times when you need a good biscuit that I have more recipes than I care to mention. The Potato and Fennel soup that I served the other night for dinner definitely called for a Cheddar Biscuit. Not just any Cheddar Biscuit, however, but one made with an amazing 6 year old Cheddar that I buy from the Empire Cheese and Butter Co-op. The Co-op is an independent cheese factory that is on the outskirts of Campbellford, a small town about two hours east of Toronto. Yes, it is worth a two hour drive. This cheese factory is one of the last remaining independent cheese makers left in Ontario. It has been in operation since the late 1870s. I have only found their products for sale in one place in Toronto, at Butcher By Nature, but even then I was not able to get the 6 year old variety. This cheese is the perfect balance of sharpness with that distinctive cheddar flavour. I keep a stock of it on hand and it was just the accompaniment I needed for my Drop Biscuit recipe. I have a certain affinity for potatoes. Yes, it’s true; I am overly fond of this vegetable. I suppose the easy and unimaginative reason is my Irish Canadian heritage, but there is actually more to it than that. In the garden, potato plants are like little secrets. 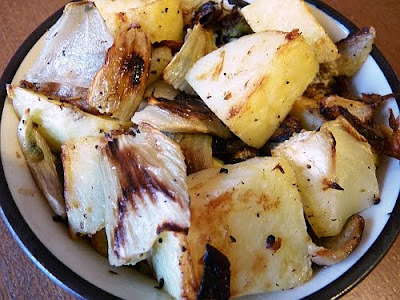 I used to love going out to my grandparents’ garden to get the potatoes for dinner. My grandfather would explain as I trotted after him, basket in hand that the potatoes were his favorite plant, because each little mound was like a treasure chest and you never knew what you would find. He would pull up two or three mounds at a time with his pitch fork and I would brush through the earth to see what was beneath. And he was right, every plant was different; small potatoes, big potatoes, a lot, a little, you never knew what was beneath and there was nothing about the unassuming plant above that would help you guess what was below. Why write and why Radishes and Rhubarb? For a long time I have been focused on food, where it comes from and how it got to my table. As a mother I am very concerned that my children form a connection with their food that transcends beyond just eating it. I believe strongly in the importance of food: good food, fresh food, real food. I think food can forge family connections and can form a basis for how you view the world. Since I feel so strongly about this I wanted to find a way to voice my personal reflections and my thoughts. 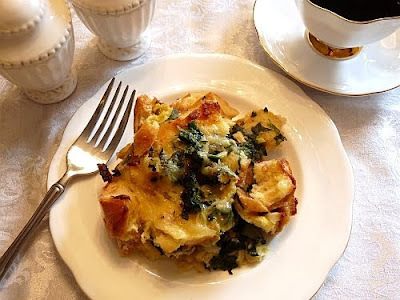 I decided the best way to accomplish that was to start a blog where I could share the recipes I love and a bit about me. But what to call this new venture? I struggled for quite a while to come up with a name that would relate to my subject and carry a personal connotation. I finally decided on Radishes and Rhubarb as it connected well with my topic but also because it has a personal meaning. Whenever I think of food, recipes and what inspires me I inevitably go back to my childhood and my experiences in my grandfather’s bakery and my grandparents' house. My grandparents live in a small town in Ontario. My grandfather owned a bakery on the main street which was a draw for the people in surrounding communities both large and small. I worked there during the summer and during breaks from school. Their house was also a focal point for food and family and some of my fondest memories revolve around that town, their home and the bakery. Behind their house was an empty lot that covered about a half an acre of land. My grandparents turned this space into an impressive garden where they grew nearly every vegetable imaginable. If you have never walked out to a garden, pulled a tomato off the vine and eaten it, then you have probably never tasted a tomato at its very best. When I try to explain how my memories of that place and time relate to my approach to food today I inevitably go back to one story to describe my grandparents approach to food and eating. On more than one occasion I remember running into the kitchen and telling my grandmother I was hungry. Her response was to tell me to go out to the garden and pick a radish or a stalk of rhubarb. I would return to the kitchen with my choice and my grandmother would have me hold out my hand. In my palm she would pour a little sugar, if it was rhubarb, or a little salt, if it was a radish. 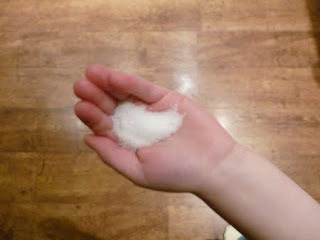 I vividly remember holding that little bit of salt or sugar in my hand...dip, bite, dip, bite. I don't know why, but as a child, I felt there was something very special about that. Somehow my grandmother had made me feel excited about eating a raw vegetable in spite of, or maybe because of, its simplicity. It is with this approach in mind (good food, simple recipes and fond memories) that I intend to write this journal. Along the way I will share favourite recipes, favorite ingredients and new discoveries.